New to PYURE Salon? 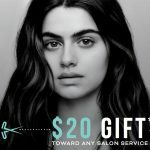 Download our $20 gift and request an appointment today! Considering a new look? Download our $20 gift to try a new experience at PYURE Salon. Enroll in our PYURE Rewards Program and earn points on the products and services you buy at PYURE—ask your salon coordinator to enroll you!